I love a hot bowl of vegetable soup when the weather is cold. It seems to warm you from the inside out and that’s a good thing when you live in the cold climate as I do. I usually make this soup on the weekend when I don’t have to go into work, so it has time to simmer on the stove top and the flavors have time to blend. I made a big kettle this weekend, enough so that I can take it for my lunch at work for the week and also to share with the rest of the family. It wouldn’t be fair if I saved it all for myself, since my family enjoys it as much as I do. Usually when I make my vegetable soup I don’t use herbs or spices of any sort. I like to use some beef bullion and some salt and pepper and leave it at that, but since I have started my blog I am determined to try new things. So once again I have stepped out of my cooking comfort zone and tried to change things up again a little bit. 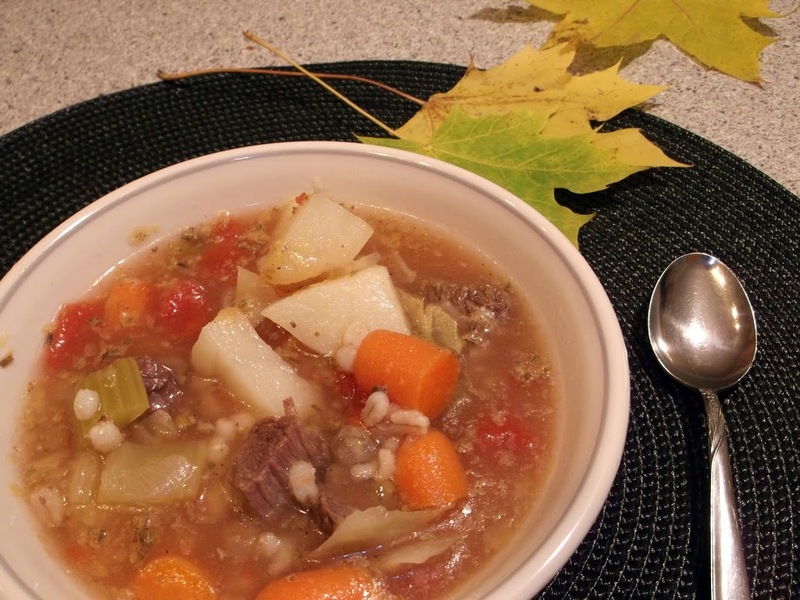 I decided to add a little rosemary and bay leaf in this soup and what a difference it made. 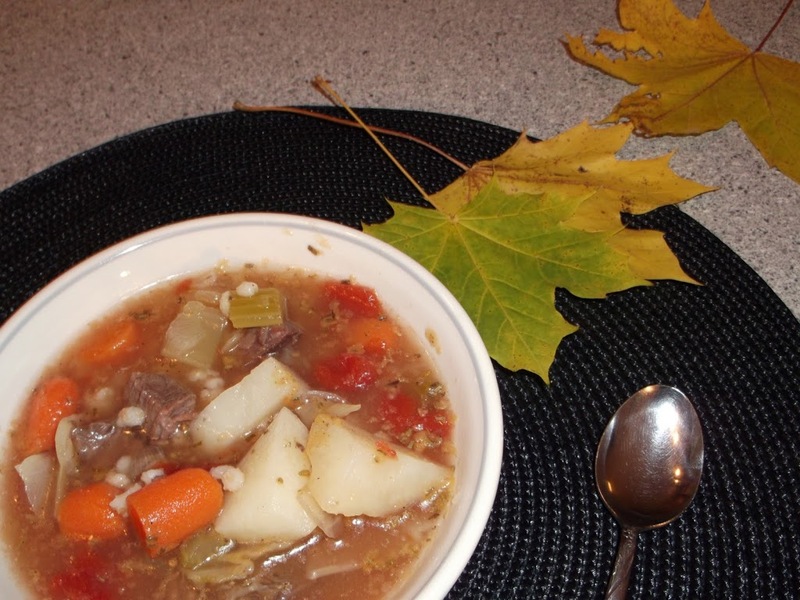 Everyone said that it was some of the best vegetable soup that I have made. I guess I found a new way to make vegetable soup. I sure am glad that I started my blog and I think my family is too. We have been trying things that we would not have normally tried and it has been a great experience. In a large soup kettle cook soup bones until meat is done. Remove bones from kettle and strain the broth (I like to strain the broth once the bones are cooked). Remove meat from the soup bones and add back to the broth. I like to chop my vegetables so that I have about bite size pieces, but you can cut to the size that you like. Add the vegetables to the beef broth, once the vegetable are added it is time to add the bouillon, rosemary, bay leaf and the salt and pepper to taste. Bring this to a boil and turn down to simmer. I like to simmer for a good hour, but be careful not to over cook, because the vegetables will become mushy. 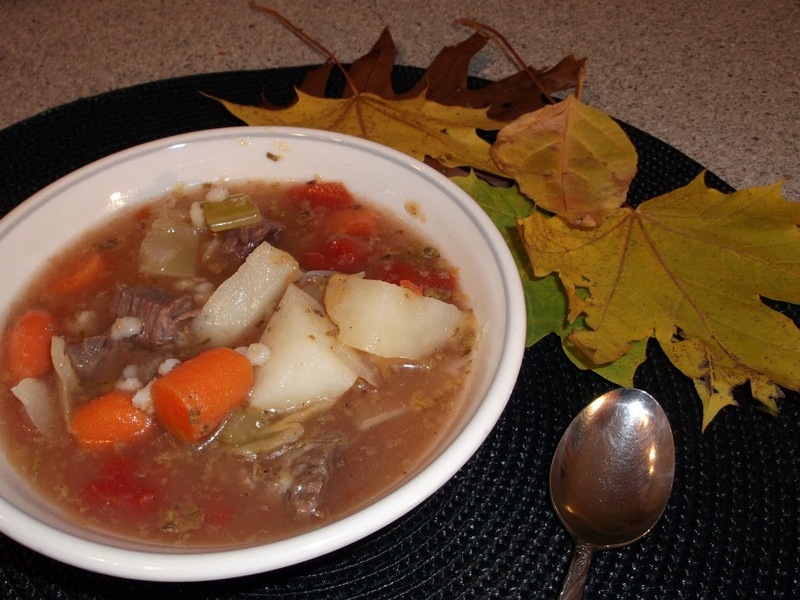 (Note: If you like to have more meat in your soup you can use a small roast beef instead of the soup bones). 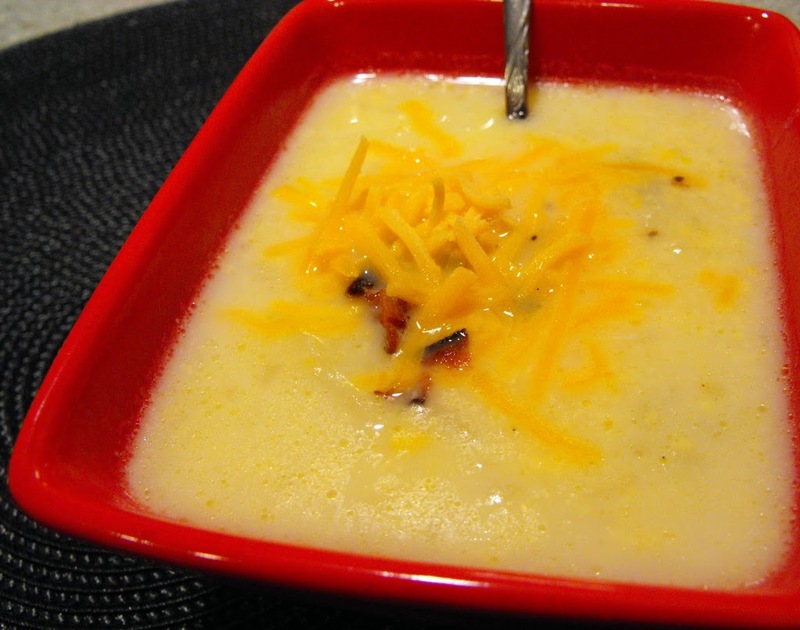 Loaded baked potato soup, comfort food for the cooler that is on it’s way. It is getting to be that time of year when I love to make and eat soup. I can eat soup anytime, but as the weather gets cooler in Minnesota I start looking forward to a hot bowl of soup. It really doesn’t matter what time of the day it is lunch or dinner or maybe both; I just love a good bowl of soup. One of my all time favorites is cream of potato. I like to make a potato soup with a white sauce and lots of potatoes. The only trouble with this soup it is time-consuming to make the white sauce, cook the potatoes, cool the potatoes…. 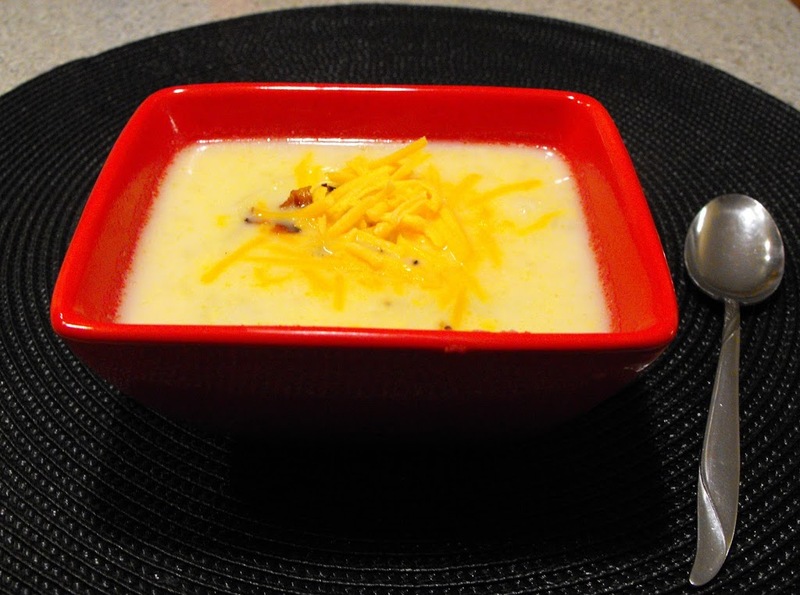 So when I found a recipe for potato soup that didn’t take hours to make, I was very excited. I decided that I had to make it as soon as possible. The recipe was found in a Kraft food & family magazine. So the other night I rushed home from work and excitedly started making a batch of Loaded “Bake Potato” Soup. I did tweak the recipe a little. The recipe called for only 2 medium potatoes and I add a couple more potatoes. Also, the recipe called for green onions which I didn’t have, so I chopped some yellow onions and cooked them along with the soup. Pierce potatoes; microwave on HIGH 5 minutes, turning over after 2 1/2 minutes. Cut potatoes into chunks. Combine potatoes, broth, and milk in a large microwaveable bowl. Microwave on HIGH 6 minutes, stirring after 3 minutes. Slightly crush potatoes with a potato masher. Reserve 2 tablespoons each of the bacon and cheese and 1 tablespoon of the onions for topping; set aside. Add remain bacon, cheese, and onions to soup. Serve topped with reserved bacon, cheese, and onions. Note: This soup was good, but I do enjoy my potato soup that I make with the white sauce and cook on the stove. I find that the soup that has the white sauce is creamier and a little more enjoyable. 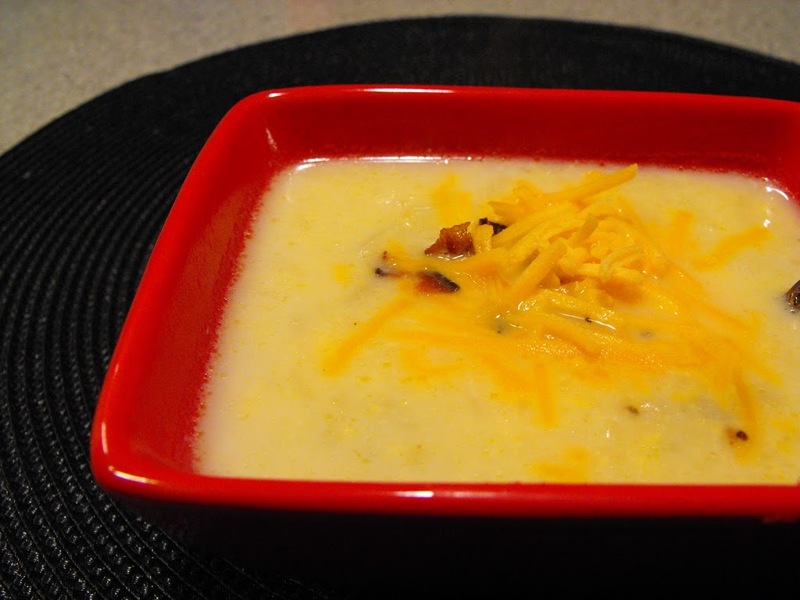 I will make the Loaded “Baked Potato” Soup again when time is a factor. Enjoy! 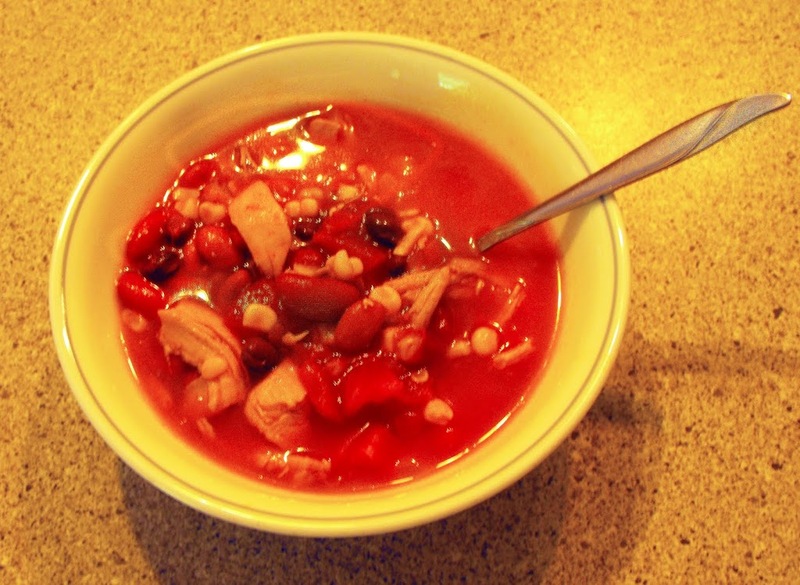 Three bean chicken soup, a great way to warm your inners when the weather turns chilly. Beans, what a marvelous food. Did you know that they are high in protein, have virtually no fat, and are full of fiber? There are many to choose from, but one of my favorites is the black bean. Among the many things I like about beans, they are so versatile. What dish wouldn’t be complemented by some kind of bean? A couple of years ago I started cooking more with beans when I decided to start eating a little healthier. I am a lover of soup; I could eat soup 7 days a week. So I definitely use beans in a lot of my soups. My three bean chicken soup is just something that I started throwing ingredients together and was surprised to see how well it turned out. I like to cook a big pot of this soup so that I can take it for my lunch at work. That is another reason this soup is so good, it tastes just as great reheated as the day that you made it. Depending on my mood I sometimes make this soup very spicy and I sometimes make it not so spicy. Also, I guess it kind of depends on the temperature outside. This week when I made this soup it was quite hot and muggy so I decide to tone down the spiciness of the soup. No need to overdo it too much. Heat up the olive oil in a large soup kettle. Dice the onions and garlic and brown in the heated olive oil. Once the onion and the garlic are tender basically throw the other ingredients in. Add the seasonings to taste. It all depends on how spicy you like your food. I usually add my spices and taste as I go along until I get to the stage of spiciness that I want. Once you have all the ingredients added bring this mixture to a boil, once it comes to a boil turn down to a simmer and let it simmer for about an hour so all the flavors come together.